I have Joomla behind a reverse proxy. I want the Home menu item to point to /, not the fully qualified domain name that it is running on. How do I do that? 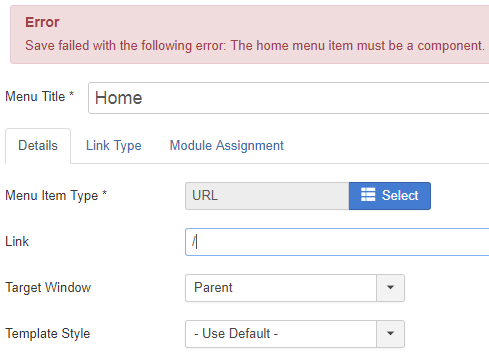 Save failed with the following error: The home menu item must be a component. It is generating HTML like the following, with the FQDN, not a relative URL. If a user clicks on a link like this, they are sent to another domain behind the reverse-proxy. Then none of the other links work. Assuming I understood your question correctly, the best way to address this solution, it to make the homepage point to the "Featured Articles" menu item, and then override the menu template to have a different URL for the homepage menu item. I've temporarily worked around the problem by using an .htaccess redirect so that if anyone visits the home page and they are not the reverse-proxy, then they will be redirected to the www site. I still think the link itself should be fixed. I should be able to have full control over that link, like I can in Wordpress. Not the answer you're looking for? Browse other questions tagged menu-item menu url or ask your own question.